Lately, I have spent a lot of time with yet another task. After I went to Hasselagård and wrote that post about it, I have found extremely interesting to look more closely at the history behind the different villas in Åkarp. So far, the results have been very exciting. Not that I have found something that is revolutionary, but it seems a lot of "important" (from a small Swedish town perspective) people have been living here and that this has always been a quite dynamic small town, despite the fact that today there is very little that could make life interesting. In order to fulfill my research I have collected few books more, to the ones that I have had purchased. "Åkarp genom seklerna" (Åkarp through the centuries) was actually a 2012 Christmas gift from Mattias. It is a small book that summarizes the most important facts from even ancient history to more modern times, but it is very incomplete. "Burlöv Kommun Historia Del I och II" (The history of Burlöv's Municipality part I and II) is currently borrowed but I am planning to get it into the collection as soon as it appears around the market with a good price. It is a very comprehensive book with a rich chapter about Åkarp and its farms. There is also a small chapter about the "merchants" in town. "Kring Lund C" (About Lund Central Station) focuses on Lund Central Station history and the railway. For this reason, Åkarp is mentioned in some parts of the book and that underlines the importance of the railway for Åkarp's development. On top of this, I have finally put the hands of the so called Åkarps samling (The Åkarp Collection), a collection of about 100 Åkarp postcards that I have been looking carefully at for a couple of years. 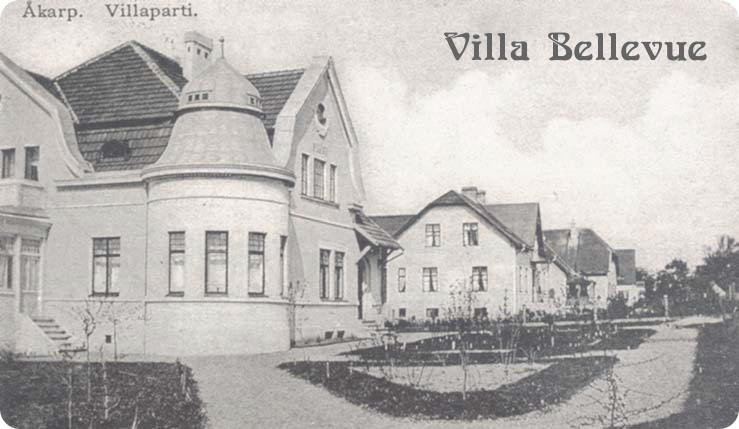 First and mostly, I have been interested in those postcards were Villa Bellevue was visible. At this point in time, I have realized that except for some postcards depicting just the pond and some swan, all the ones with the houses were relevant for my curiosity.